Clint Zeagler, co-curator and co-designer of the “On You: A Story of Wearable Computing” show at the Computer History Museum. While wearables may be the latest rising trend, the concept of technology that can be worn on one’s body has actually been around for decades. Some of those original concepts even faced the same challenges that current devices currently are up against. A new exhibit, “On You: A Story of Wearable Computing” at the Computer History Museum in Mountain View, California, showcases how wearables have evolved and overcome many challenges during that time. In 2001, Thad Starner, who was part of the original MIT “borg,” founder and director of the Contextual Computing Group at Georgia Tech’s College of Computing, where he is also a professor, and co-curator of the exhibit, published an article in IEEE Micro that outlined the challenges of wearable computing at that time. 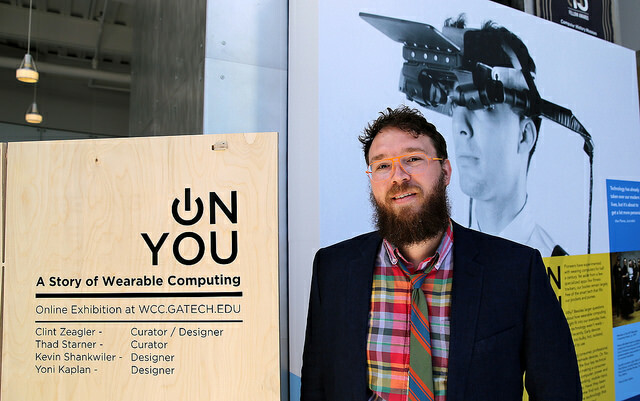 In the paper, Starner presented several critical challenges facing wearable computing including power and heat, networking, mobile input, and display, each of which is showcased at the exhibit, complete with wearable examples of the time. It turns out, many of the challenges confronting developers of wearables in the past decades still hold true today. But smaller circuitry, advanced power and communications capabilities, and better graphical outputs have turned the field of wearable computing into a skyrocketing movement. “The show is a really good retrospective of how we met the challenges along the way to be able to get the device that you can wear,” explains co-curator and co-designer of the exhibit, Clint Zeagler, who is a research scientist at Georgia Tech’s Interactive Media Technology Center. According to Zeagler, wearable computing early on had vast challenges. “There was no cloud in the early ‘90s,” says Zeagler. “We went from a motorcycle battery to something that is one-fourth of the size.” Mobile input was another hurdle, especially when coupled with minimal or lack of connectivity. “If I want to have a mobile computer, one of the things that I want to be able to do is give input to that computer while I’m walking, otherwise I’m wearing it, but I’m having to stand in one spot,” explains Zeagler. Connected wearable users 15 years ago had to use a “bag phone” to be able to get a signal to a connected wearable, but “if you moved 3 feet then everything had to be reconfigured,” says Zeagler. The trend to build wearable computing sprouted up across the globe, primarily driven by the military, academia and medical industries as well as makers who were creating their own wearable systems for personal use. Many of these inventions are on display at the show. Designed by Mark Spitzer in 1997 for Thad Starner, the MicroOptical prescriptive glasses can be viewed as a precursor to Google Glass. 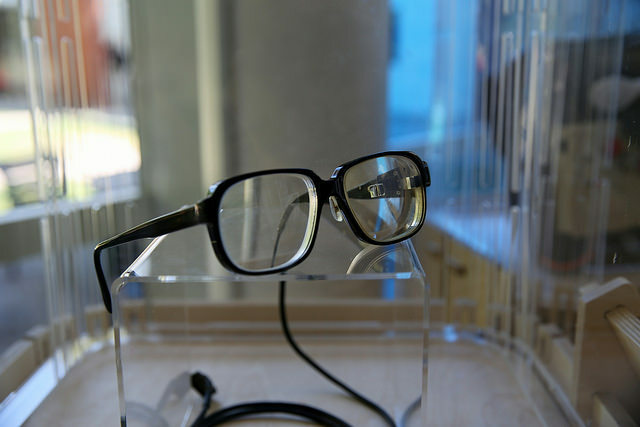 Several of the items at the show are one-of-a-kind inventions, including a pair of prescriptive glasses designed by Mark Spitzer in 1997. Specially made for Starner, the glasses sported a monochrome display that had a 9-degree field of view and a 320 x 240 pixel resolution. The LCD panel in the earpiece had its image projected and reflected through the lens and is quite similar in design to Google Glass. According to Zeagler, Starner wore the glasses for only a couple of months because the weight of the glasses kept causing it to slide off his face, impairing the viewing of the display. 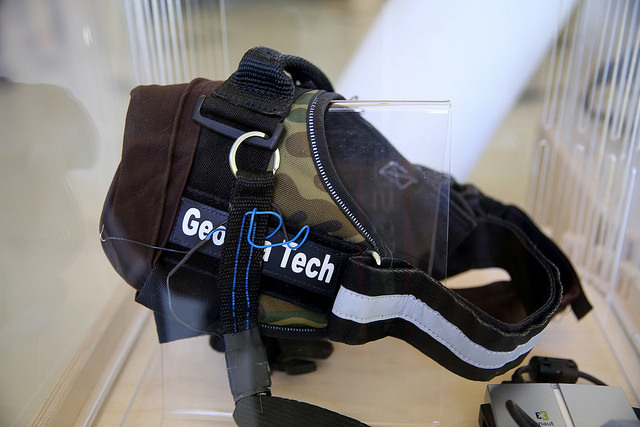 The FIDO, an academic prototype, explored the idea for canine wearables to assist in the communication between service dogs and their handlers. There are even wearables for dogs on display at the exhibit. The Fido Project, which Zeagler worked on in 2013, examined ways for assistance and rescue dogs to use wearables to better communicate with their handlers. According to Zeagler, the designers were faced with a similar human interface challenge but this time with canines. Tug and bite interfaces were tested, with the team eventually finding that a bite interface, using a capacitive air bladder (not on display at the show), had the most effective performance. While the exhibit aims to look back at the evolution and challenges in the wearable space, it also provides glimpses of the future. Zeagler says the industrial, product and experience designers helped evolve academic design into producing “an output that gives an experience that is helpful to the individual.” Zeagler believes the next evolution similar to fitness trackers will come with heads-up displays. He also thinks the fashion industry, using “fully integrated garments where the technology is actually woven into the fabric of the garment” will be a huge disruptive force to the wearable marketplace. While Zeagler believes wearables could detach from the smartphone, no device will be completely autonomous from the network – wearable devices must connect to something eventually, whether it is a smartphone or directly to the cloud. What will change are the form factors, the size and inevitably, the function.